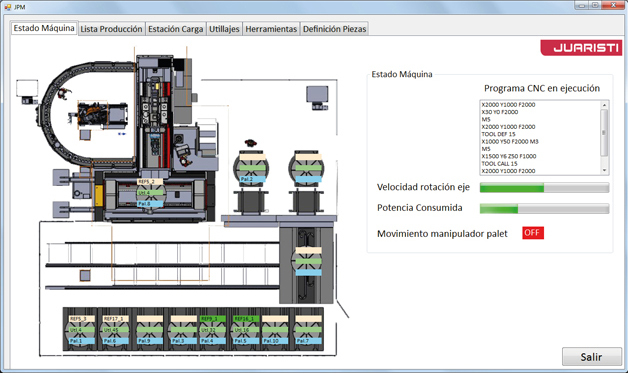 More than 10 years after the first implementation, JUARISTI presents the third generation of SUPERVISOR Software for integral production management. This latest version of the software permits integrating several pieces of production equipment as well as direct and automatic communication with the client’s ERP. The graphic interface has also been improved to achieve an intuitive and easy-to-manage application. Both in complex FMS systems with several machines and pallets, as well as in more simple applications with just one machine, the new SUPERVISOR v3 software permits the centralised management of tools, pallets, production orders, tooling as well as part programs. SUPERVISOR automatically connects to the company ERP to receive the manufacturing orders. Depending on the availability of the production equipment, it generates a production plan and automatically calculates the tool needs (warning if there are not sufficient tools), tooling, pallets, and previous and final inspections. In short, it organises and plans the machines to get the most out of them. Thanks to this Software, clients can work unattended (without operator), using the most advanced part inspection systems, tool breakage checks, adaptive control implementation, measurements on machines, etc. In a very intuitive and visual manner, it can control the state of the machines and auxiliary systems, include assembly instructions, control datasheets, quality deviations, and obtain personalised reports on machined parts and manufacturing plan. In short, the new SUPERVISOR Software can obtain maximum yield from the JUARISTI machines, groundbreakers in Industry 4.0.